Christian Heritage Centre | 3D Model of the Local Area (in the 1880s) now at the Centre! 3D Model of the Local Area (in the 1880s) now at the Centre! 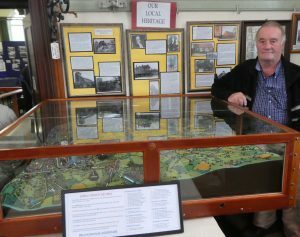 We have recently been presented with a complete and to scale model of the area of Rowley Regis and Old Hill as it was in the 1880s. This masterpiece of accuracy and detail, mounted and presented in a 4’ x 4’ glass display case has been the labour and love of Mr Melvyn Jackson of Blackheath. Melvyn tells us that it involved three years of research and it is clear that it must also have involved a great deal of patience and skill to bring about its construction. The model reveals that at that time there were about 30 pits, numerous churches and chapels, schools, and 42 public houses. In spite of this, the area was still predominantly rural with coalmines set in cornfields and grazing land. The stone quarries, marl holes and brick works were a prominent feature of the area and are all clearly marked together with the many workshops and the beginnings of the larger industrial undertakings that were eventually to so dominated the landscape. We are extremely pleased with this valuable new addition to our collection as we are most grateful to Mr Jackson for gifting it to us. ….. Why not come and see it!